Is there a way you can collect email address while people are waiting in your queue? How Much Waste Does Your Food Truck Generate? What If You Could Get That To Zero? As a food truck vendor, your choices have a huge impact on how much waste you, and your customers generate. Where there is a problem, there is an opportunity to innovate! There are a range of options. Some will cost you less than what you currently pay for packaging and disposal, some about the same, and the premium options will cost a little more (but you can use that as a point of difference and actually increase your business). Reward. The most ideal measure you can take to encourage uptake of reusable items is to reward this behaviour. Give customers a discount for bringing their own reusable plates or provide an incentive for the uptake if this behaviour. 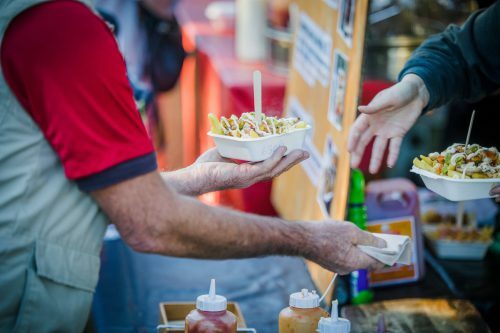 This may mean you have to raise your food trucks prices by a dollar in order to provide a discount but you’ll save money in minimising your consumption of disposable items like plates, cups and cutlery. Buy Local. You can have a big impact behind the scenes by integrating reusable packaging in your food truck preparation and by sourcing foods locally and in bulk. Replace. Refusing disposable packaging and replacing it with reusable alternatives means you are directly voting with your dollar towards less waste. We are all guilty of choosing the convenient option, be it sometimes or all the time but remember! Convenience is disposable! Meaning we have to power to dispose of lazy behaviours and that all things convenient have a short and disposable consumer life. Compost. Ensure all your compostable waste goes to compost or worm farms. Many customers want to do the right thing and will separate their waste into the correct bins when they have the option. Perspective. Over and above being a vendor, an event organiser or a participator, the most impactful change we can make is to our perspective. Waste is only waste cause we all say so. If we start to perceive waste as resources, as money, as an opportunity to build community, then all of a sudden we can have a movement of change makers that go above and beyond to utilise free resources, saving them from the steaming heap of waste that ends up becoming highly toxic and harmful to us and our local environment. Awareness of waste at events and festivals is growing and has been on the up for a few years now. Zero Waste services promote the sorting of waste with the intention of diverting the maximum percentage of waste away from landfill. Recently, compostable consumables have come on the market. They feature plant plastic P.L.A. Poly Lactic Acid is a #7 plastic meaning “other plastics” and is derived from corn starch, tapioca starch and sugar cane based on its origin of production. Sadly P.L.A is a chronic victim of “green wash” marketing tactics. Green wash is marketing lingo for selling an environmentally friendly product/image while still having a negative environmental impact. Let’s be clear, it’s unfairly complicated. P.L.A based products, usually cups and cutlery are compostable but only in very optimum and specific conditions. A domestic compost won’t get hot enough to process P.L.A into fertiliser but an industrial heap will. In the Bay of Plenty, we’ve been sending it to Revital, our local industrial composter with heaps that will get hot enough to process the P.L.A but at a rate that is twice as long as any other compostable waste. As a business, Revital needs twice the length of time than usual to have a sellable product which is unfair to them where the alternative, tossing them in the landfill is unfair to humankind. The consistent element here is the disposable nature of serveware. The latest movement in zero waste at events is the reusable culture. Little Big Markets have an exciting new resource aptly named, “The Dish Pig” in an attempt to kick start this reusable culture. Food vendors at little big markets serve appropriate meals on porcelain plates with the customer paying a deposit on top of the meal and this cost is refunded upon hand over at the dish pig. We wash the plates, refund the money and the cycle swings round and round. There’s no monetary profit but instead a gradual gain in awareness and reusable behaviour. This is cutting edge and will encounter some growth pains with development but the end goal is less disposability and a higher uptake of the reusable mentality. This article was written by Vincent Callister. He has worked in a Zero Waste capacity at events, markets and festivals over the last four years such as Splore and Wanderlust. Based in the BoP, he has some exciting plans in association with Little Big Markets to minimise waste. He acknowledges that there is no such thing as true Zero Waste and prefers to label his work as resource utilisation. He can be contacted at vcallister@mac.com for comments, questions and chit chats. Hi, I'm Sheldon Nesdale and I love Food Trucks. I love food trucks for 4 reasons: They are delicious and gourmet, they are great value for money, they are mobile and they are fun! The purpose of LoveFoodTrucks.nz is to list all the Food Trucks in New Zealand so you can try new ones and find your favourites.